One positive to come out of the New Jersey Devils’ 2015-16 regular season has been the obvious improvement in some of the team’s young players. It was well-known that this would be the year that some of the team’s prospects would finally have a genuine opportunity to play more consistently with the big club. It has not been a perfect road for some of these young players. There have been ups and downs but how a prospect responds to adversity also says a lot about his potential. As the regular season gets ready to wrap up, it is becoming apparent that general manager Ray Shero and head coach John Hynes have already started evaluating which young talents have a future with the franchise. At trade deadline fans said goodbye to two of the team’s young players in forward Stefan Matteau and defenseman Eric Gelinas. 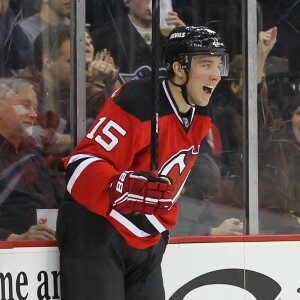 Matteau, New Jersey’s 2012 first round draft pick, could seemingly never establish himself with the Devils. Regardless of injuries or how players were performing, he was regularly listed as a healthy scratch and when he did crack the lineup, he never had his breakout moment. His game did not reach the level the Devils needed it to. His size rarely translated to the physical style of play people were hoping to see from him. If Matteau’s game is going to develop then he needs to play and as the season wore on, it became abundantly clear that he was not in the team’s future plans. Nevertheless, it did come as somewhat of a surprise to see Shero move Matteau to the Montreal Canadiens on deadline day considering teams did not have much to assess. In return for Matteau, the Devils received forward Devante Smith-Pelly who has had a positive affect on the team’s offense. Matteau’s trade has worked out well thus far for the Devils and more than likely for him as well as a change of scenery and system may be beneficial for the 22-year-old. Similarly to Matteau, Gelinas could not stay in the team’s nightly lineup, which was something he also struggled with previously under co-coaches Lou Lamoriello, Scott Stevens and Adam Oates. Last offseason people thought a defenseman would be moved for picks and it was typically believed to be either Jon Merrill or Gelinas. However, it did not happen and Hynes got to evaluate both players. Gelinas exhibited flashes of solid defensive play and his slap shot has become well-known throughout the league. Nevertheless, his shot lacked accuracy and his defensive development stalled, which to be fair could have also been the result of not consistently playing. Lineup spots are earned and Hynes along with his staff saw something that was not resonating nightly. 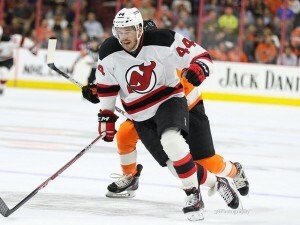 Just like Matteau, it was time for Gelinas to move on from the Devils and find a new home with the Colorado Avalanche. 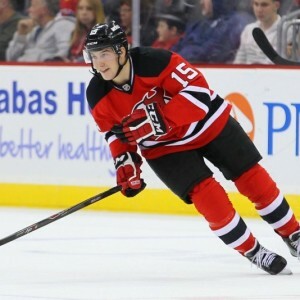 Meanwhile as Gelinas and Matteau adapt to new teams, several of the Devils’ young players are beginning to make a name for themselves in New Jersey. Whether it is forwards Joseph Blandisi and Reid Boucher, or defenseman Seth Helgeson, each is in the midst of establishing their NHL game. Blandisi was a dark horse to make the team straight out of camp during the preseason and alas he was sent back to Albany. But once he got his chance there was no looking back. He excelled and displayed his fast hands and feet as well as a gritty style of play. Most importantly though, he has exhibited a pure skill-set that has surprised some people. 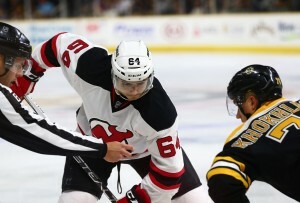 While Blandisi’s game is still developing he is proving that his passing ability, shot and aggressive style of play should be a longterm asset for the Devils. Helgeson has waited for his opportunity to consistently play in New Jersey. Previously he has made appearances with the team but has not been able to remain with the club. However, now he is regularly in the lineup mainly due to his solid effort and reliable play. He has not had a standout moment as of yet but rather a combination of smart plays that have kept him on the ice. While Helgeson and Blandisi have earned their spots, neither of them have faced the expectations that Boucher has. In the past Boucher encountered the same issues that many young players do. His game was inconsistent and he often found himself back in the AHL. Now it appears though that Boucher has possibly turned a corner. His development has undoubtedly progressed and much of that is due to the confidence that he is exuding on the ice. He is not hesitating with the puck and most importantly he is shooting it. Another big factor in Boucher’s development could be his linemates. Since returning to New Jersey, Boucher has often played with Travis Zajac and Kyle Palmieri, which relieves some of the pressure on the young forward. Realistically, his numbers are not going to resemble Steven Stamkos’. But if Boucher is with the team full-time next year and still playing with skilled linemates like Zajac and Palmieri, then he should be a regular contributor on the scoreboard. It would be safe to assume that Blandisi, Boucher and even Helgeson could and realistically should find themselves on the Devils’ roster come opening night of the 2016-17 regular season. If the team is going to succeed, New Jersey needs their prospects to rise to the occasion and fortunately people are seeing that some of them are capable of doing just that.